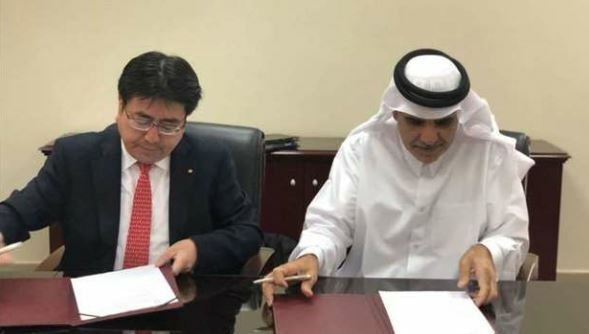 QEWC, Japan’s Marubeni sign pact | Qatar Electricity & Water Co.
Qatar Electricity and Water Company (QEWC) signed an agreement with Japanese company Marubeni to facilitate visits by Qatari engineers, employees and joint venture companies to Marubeni plants and projects in various locations in Japan, the Philippines and Oman. Qatari engineers will be briefed on Marubeni’s practices in management, operation, maintenance, risk management, quality management and planning. The agreement was signed by QEWC General Manager and Managing Director Fahad Hamad al-Mohannadi and Yoshiaki Yokota of Marubeni Company, at Qatar Electricity & Water Company headquarters. This agreement is the second between the two companies. It was signed after the successful implementation of the first agreement last year. Qatari engineers expressed their satisfaction with the benefits of the visit programme and prepared detailed reports on these benefits and proposals for business development. Al-Mohannadi stressed the keenness of the Qatari Electricity and Water Company to develop the Qatari engineers’ skills and expressed the company’s desire to discuss a long term agreement with Marubeni. He pointed out that Qatar Electricity and Water is closely linked to Marubeni. Marubeni owns a stake in Mesaieed Power Company Limited in partnership with Qatar Electricity and Water Company, Qatar Petroleum and Japan’s Chubu. Mesaieed Power Company Ltd has provided opportunities for Japanese employees to work with the company and benefit from its expertise and practices.